Modern Commemorative Gold Coins began in 1984 with ten dollar coins struck to commemorate the L.A. Olympics. Most of the subsequent issues have been five dollar coins although a couple of ‘tens’, including a bi-metallic ten dollar commemorative, have been struck. Many low mintage Modern Gold Commemoratives exist and in recent years numismatists have gained an appreciation for these coins and many of the rarest Modern Gold Commemoratives have seen their prices go up dramatically! 1995-W. GEM. Torch Runner $5. 1995-W. PCGS. MS-69. Stadium $5. 1995-W. PCGS. MS-69. Torch Runner $5. 1996-W. GEM. Flag Bearer $5. 1996-W. GPF. Flag Bearer $5. 2001-W. PCGS. MS-69. Visitor Center $5. 2002-W. GPF. Salt Lake City Olympics $5. 2007-W. NGC. MS-70. Abigail Adams $10. 2007-W. NGC. PF-70. Abigail Adams $10. 2008-W. NGC. PF-70. UCAM. Louisa Adams $10. 2008-W. PCGS. PR-69. DCAM. Elizabeth Monroe $10. 2013-P. CBU. 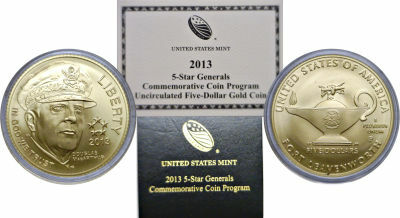 5 Star Generals $5 MacArthur.